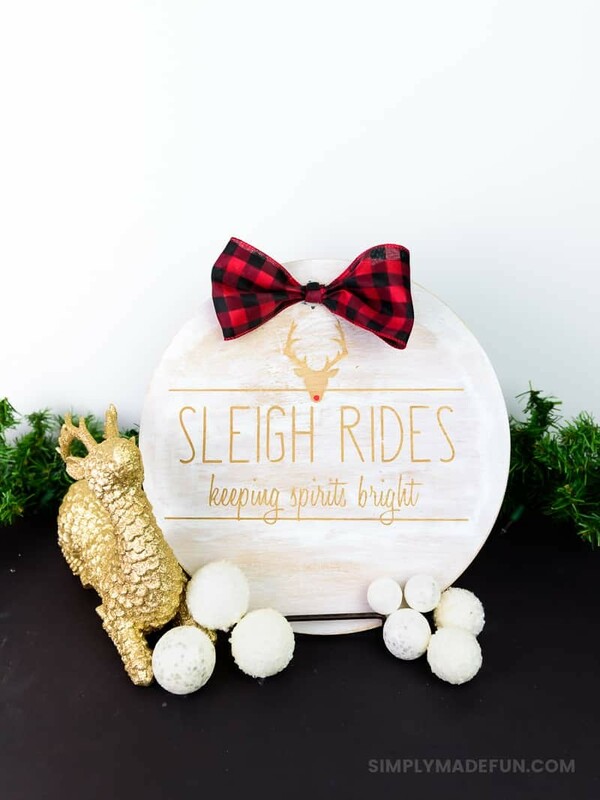 This Rae Dunn Inspired Wooden Holiday Sign is perfect for the transition from Christmas to winter decor and it’s so simple to make! Why does the house always feel so empty after all the Christmas decorations are down? Part of me loves how clean things feel once it’s all gone but mostly I just feel like things are a little too minimalist around here. Which is usually when I pull out my Silhouette Machine and get crafty. The fact that it’s winter, I have no “themed” decorations, and my house still needs furniture and wall art is the perfect excuse to make a Rae Dunn inspired wooden holiday sign! Ever since I made those Rae Dunn Christmas ornaments I’ve been obsessed with The Skinny font for projects. Back before Christmas I picked up another wooden charger (the exact one I used for this snowman project last year) at the Target Dollar Spot, but it took forever to figure out what I wanted to do with it. The hardest part with this charger is that it has a really dark Christmas tree on the top of it. I tried to use a stain to cover it up but it wasn’t dark enough (never mind the fact that the stain was old and gross….which I didn’t realize until after I put it on the wood charger). Luckily I had some buffalo chex ribbon left over and used that to cover up the Christmas tree. 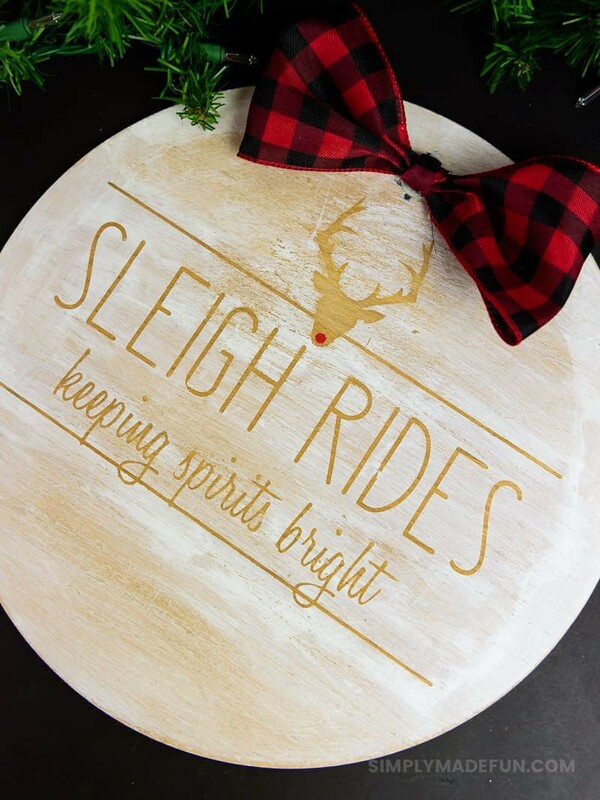 Make a Rae Dunn Inspired wooden holiday sign of your own! + Cut out your design on your stencil vinyl, weed the design, and then use transfer tape to put the stencil on top of the wood charger. + Mix your white paint with water (equal parts paint and water) and then brush it over the stencil. Wipe off the excess paint until you get your desired coverage. 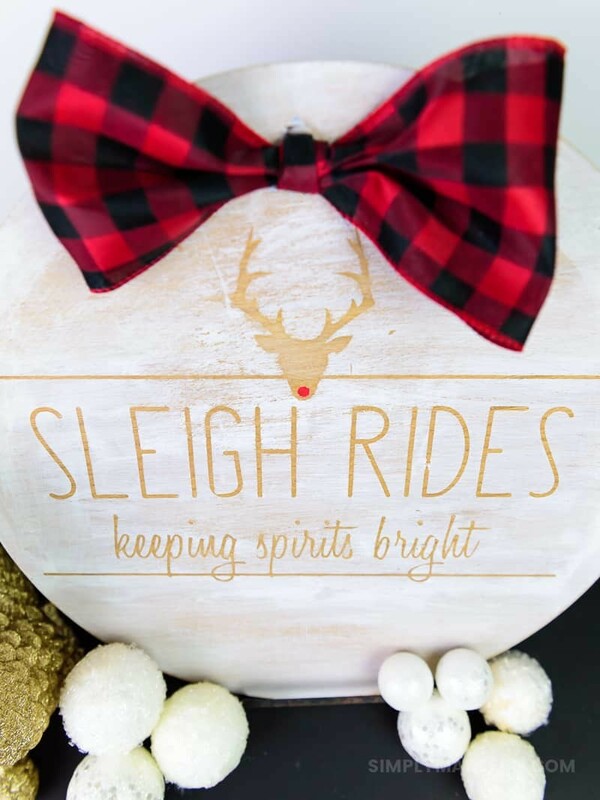 + Paint a small red nose on your reindeer (optional) and then tie a bow with your chex ribbon (I’ve got the perfect tutorial for you here!) and hot glue it to the top of your charger. Target Dollar Spot crafts are some of my favorites because they’re just so cheap and you can always make something fun out of them! I picked up some other stuff for Valentine’s Day from them recently and I cannot wait to share all of those ideas! But for now I’m enjoying all the winter craft ideas and projects that I need to put on my walls! These stenciled signs are a few of my favorites!